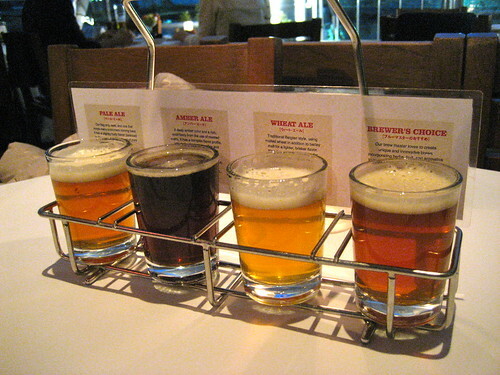 Beer samples- for when you want to try them ALL. Flicker photo by Christain Van Der Henst S.
April Brews Day is this Saturday, April 30th, 2011. Over 30 breweries will be sampling their beers at the Depot Market Square (where the farmers market is), much to the delight of Bellingham beer aficionados. There will also be live music performed by Out of the Ashes, Keaton Collective, and bandZandt. April Brews Day is a benefit for the Max Higbee Center, which is a nonprofit organization in Bellingham serving people with disabilities. April Brews Day costs $16 in advance, $20 at the door, and $30 for VIP. It starts at 6:30 and runs until 10pm, although if you get the VIP ticket you can get in at 5:30. Judging from last year’s crowd, I would recommend the VIP ticket! You can get tickets in advance at Village Books in Fairhaven, the Community Food Co-op, Boundary Bay Brewery, and Chuckanut Brewery. Entry includes a tasting glass and beer samples. Food and additional beer samples will be available for purchase. ← Happy (almost) Easter #Bellingham!